After a series of cold, cloudy days, the long winter may finally give way to a nascent spring. It was refreshingly warmer on Thursday, April 12. And, like the arrival of spring, it's a time of new beginnings at American University. The inauguration of AU's 15th president, Sylvia Mathews Burwell, was a celebratory occasion. It was a chance to contemplate where AU has been, while aspiring for an even brighter future. In Bender Arena, Burwell - AU's first woman president - was introduced by Board of Trustees Chair Jack Cassell. There were also remarks from former President Neil Kerwin, Provost Scott Bass, Washington, DC, Mayor Muriel Bowser, and Atul Gawande, a surgeon-author and Oxford classmate of Burwell. Film and TV director Davis Guggenheim - of An Inconvenient Truth fame - served as master of ceremonies. The event had strong student involvement, with contributions from the Color Guard, AU Gospel Choir, Prelude Brass Ensemble, AU Jazz Quartet, and the AU Chamber Singers. Toward the end, there was a lively, artistic montage of student voices created for the occasion by theatre professor Caleen Jennings. Also on hand were the Board of Trustees, alumni leaders, and faculty. University Marshal Andrea Pearson, a professor and chair of the Faculty Senate, welcomed the AU community to the ceremony. 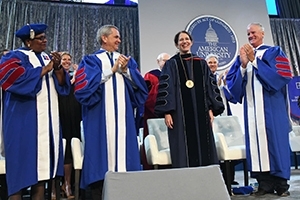 Cassell, Pearson, and Student Trustee Valentina Fernández were on stage to present Burwell with the presidential medallion and a copy of the Act of Incorporation and Bylaws of American University. Burwell's family attended the event, and she drew connections between her personal background and her role at AU. "While the title of president is an incredible honor, it's a distant second to my favorite title: mom," she said. "To my new family here at American University, thank you all for this honor and this responsibility. I will strive to fulfill the trust that you all have placed in me." Burwell then talked about her small-town upbringing in Hinton, West Virginia. "My path to this podium actually started in another community…One that treasured education, hard work, and service," she recalled. "It's a town that's about the size of our gathering; small but overflowing with a commitment to one another." She referenced Halloween trick-or-treating for UNICEF and serving ice cream at Kirk's Home of the Hungry Smile in Hinton. "If Suzie got a dip of maple walnut and she had wanted strawberry, you got instant feedback. It was really great training for someone who is a university president in the age of social media," she joked. "You worked hard in order to help others. Service was at the core of our community." Earlier, Burwell's friend Guggenheim vouched for her lifelong dedication to service. "She's distinguished herself at everything she's ever set her mind to, but she's also one of the loveliest people I've ever known," Guggenheim said. "She wants to make the world a better place, which can sound trite. But if you've been doing it since sixth grade, it's also true." In her address, Burwell found parallels between Hinton ideals - education, service, hard work with a smile - and AU's history. "Those values that pushed me forward are the same values that I will hold as your president. You see, those are the values of American University. They were etched into our founding," she said. Burwell, a former secretary of the US Department of Health and Human Services and director of Office of Management and Budget, mentioned the numerous world leaders who have visited AU. She highlighted President Theodore Roosevelt dedicating the cornerstone of the McKinley Building, and President Dwight Eisenhower's call to wage peace at the the School of International Service founding. She recalled President John F. Kennedy's words at his famous AU commencement speech. Kennedy said that problems of war and peace are man-made, therefore they can be solved by man, Burwell noted. "I would add just one slight edit to that: Women are pretty good problem solvers, too," she quipped. Burwell tied in the lesser-known history of newly freed, working-class African Americans who settled where Tenleytown stands today. And in elucidating AU's shared past, she struck themes of inclusion and unity. "We're a university of strivers and dreamers, of activists and artists, of scholars and servant-leaders. We realize that when we all contribute, we all succeed. We are all, quite literally, one AU." Burwell praised the cutting-edge work on campus. She mentioned the new Center for Postsecondary Readiness and Success, the Don Myers Technology and Innovation Building, and the forthcoming, state-of-the-art Hall of Science. "Our past does not confine us. It propels us forward," she said, "toward an uncharted future - with nearly boundless opportunities and challenges." She also didn't shy away from the difficulties facing higher education and the economy. "On the one hand, a college education has never been more essential to success and the ladder of opportunity. On the other, there is great pressure on what education looks like and what it costs." And Burwell discussed how campuses can be a setting for broader societal tensions. "Today's national pressures can force our students to look at issues like inclusion and freedom of expression as a binary choice, rather than the complementary and unifying ideas that they really are." She added, "Times of great challenge call forth great leadership. American University, we are poised to lead." Burwell outlined five pillars she believes will be crucial for AU's collective future. The university must forge partnerships with local and national groups, in both the public and private sectors, to achieve excellence. AU needs to lead in research, teaching, and experiential learning. "We need to be the university of 'and,' not 'or,'" she emphasized. AU must set its sights on the future - the future of learning, the future of work, and the future of citizenship - and be a leader in charting the course in each of those areas. AU must nurture our connection with Washington, DC. The mayor made earlier comments about how Burwell is uniquely qualified to do this. "She knows DC, she knows business, she knows budgets, she knows numbers, she knows politics, which means she's perfect for our town," said Bowser, also an AU alumna. AU should make a positive impact on the world, combining scholarship with service. The goal is to produce changemakers and changemaking scholarship, she said. As she concluded her speech, she brought the conversation full circle. "Just like Hinton, the best reflection of American University is its people. That is our strength. That is how we will navigate through the challenges ahead," she said. "That, as one AU, is how we will nurture the fire of our souls and build a future worthy of the legacy we inherit." Burwell thanked the community with a final, fitting sendoff: "Go Eagles!" From Obama's Cabinet to the Presidency of American U.